There's no one better at promoting Donald Trump than the man himself. 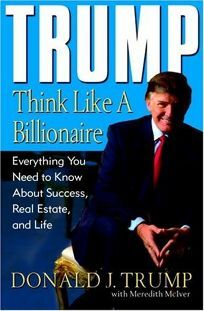 In this slim guide, which Trump says readers should consider ""the second part of an ongoing conversation between you and The Donald"" (the first part being his previous book, How to Get Rich), he offers his two-cents on everything from picking a mortgage broker and selling a house to dressing and grooming for work. Unfortunately, the book is packed with more cliches and glowing comments about his various properties (including his Mar-a-Lago resort, ""one of the most beautiful places on earth"") than practical advice. For instance, his advice on how to spot a fraud is, ""If it seems too good to be true, it is,"" and his counsel on grooming is, ""Dress for the job you want, not the job you have."" Even his ""Mar-a-Lago Diet"" boils down to eating balanced meals. Each topic is covered in two pages or less, even big ones like How to Sell a House and How to Manage Debt, while other segments--such as A Week in the Life, which superficially covers a rather uneventful week in Trump's life--run on far too long. The final third of the book consists of a teaser for the new season of The Apprentice. Trump provides a general overview of the first four episodes, but doesn't give away any specifics about who gets the boot. Instead, he coyly says, ""My first firing wasn't terribly difficult, although I always feel bad for the first person to go because he or she will miss out on so much."" Though Trump claims in the book's introduction that ""if you absorb only ten percent of the wisdom in this book, you'll still have a good shot at becoming a millionaire,"" many a reader will likely finish this book feeling distinctly unenlightened.